Rumors are swirling of an ethics violation against the lame duck Annapolis Mayor Ellen Moyer. It appears that City Hall has been busy for the past 24 hours trying to remove the Mayor’s foot from her mouth and cover up her vitriolic comments on her official blog. On Sunday, the Mayor took to her official blog to wholeheartedly trash a democratic candidate running for mayor. We felt it was highly inappropriate and attempted to contact the City’s Public Information Officer Rhonda Wardlaw. Our emails and phone calls (not surprisingly) were not returned. NOTE: Ms. Wardlaw’s email and voicemail indicated that she was out of town for the weekend. We did not receive a response from City Hall prior to publishing. The intent of the “not surprising” comment was not to Ms. Wardlaw (as it read) but to the City in general who was making changes to their website and blogs as this story was developing. Ms. Wardlaw has always been very prompt in returning calls and emails. We regret the error and confusion. But on Monday, the link to the blog was removed from the City’s website and the blog itself has been severely edited to remove the attack the Mayor made on Trudy McFall. All that is left is a terse message. Due to an administrative error, the Mayor’s personal comments have been removed. Mayor Moyer’s Personal Blog will be back as soon as possible. Sorry for any inconvenience and thanks to each of you who took time to respond. If this indeed was an “administrative error”, the City is in luck. For a copy of the original blog contents, you can click here! 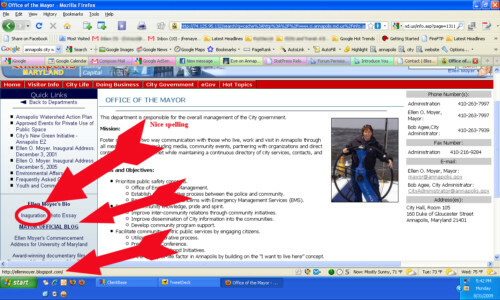 And if you are looking to re-create the City’s Website page that referenced her “Official” blog, we have a copy of that as well. Rather than attempt to cover this up, why doesn’t our Mayor come clean? This Mayor has proven time and time again that she is incapable of running a city. If there ever was a poster child for a City Manager, it would be Ellen O Moyer. But now, because of the ineptitude, we are wasting more taxpayer dollars as she orders her paid political appointees to cover her tracks. To read other commentary on this latest abuse of power, you may want to read Annapolis Capital Punishment’s commentary on the situation. Annapolis Political Scene also has a view on this as well. The upcoming elections are going to be nasty enough as it is; we don’t need to add the current Mayor’s incompetence into the mix. The Mayor's page no longer has the link to the blog. It still has the spelling error!